I have a cousin (by marriage) who lives on Broad Beach, in one of the first houses built there. It hasn't changed in decades, a two-bedroom bungalow with a small deck and big windows that face the water. Realtors circle her place like carrion crows, drawn by the 30 feet of beachfront, the clean slate of a tear-down, the millions of dollars be made. Do they disclose to new buyers the battleground Broad Beach has become? I wonder. I love to hear her talk about the old days, when her nearest neighbor was a quarter mile away, when living in Malibu was like living at the very end of the earth. Now she's surrounded by houses so elaborate and large, it's just silly. Not so silly are how her new neighbors try to keep the public off this public beach - misinformed guards, misleading "private property" signs, misguided sand-moving projects. The most hare-brained scheme involved moving sand from the beach to build a gigantic, continuous barricade in front of the houses - the Great Wall of Broad Beach - to keep the scuzzy public at bay. I saw it, out for a walk at low tide to look for sea glass. Big yellow bulldozers started at the tideline and scraped tons of sand from the public beach, heaped it in great piles in front of the houses. People complained. A lawsuit was launched. The public won. Sort of. Because no matter how it looks now, and it looks as though it's almost back to normal, Broad Beach is not the same. The grunion, whose eggs were in the sand those homeowners piled in front of their precious mansions, have not bounced back. The sea glass you used to be able to find is ground to bits or gone. Fewer sea birds come to feast. The level of the sand itself sits just a bit lower, scraped away by each cycle of high tide. 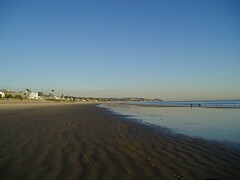 Jenny Price and I walked Broad Beach yesterday - it's one of her favorite places, one of her favorite causes. We puzzled over how much the place has changed and, so long as there are houses to be sold, money to be made, how little anyone cares.